Building off the success of Ubisoft's top-selling CSI: Crime Scene Investigation PC game, CSI 2: Dark Motives is a first-person adventure game that will test players' nerves and intellect as they examine crime scenes, question witnesses and analyze evidence utilizing the latest in forensic equipment. The new CSI PC game features a number of gameplay improvements including in-depth evidence examination, scalable difficulty and more interactive lab functionality. 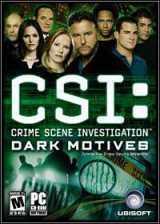 It will once again feature the likenesses and voices of the entire CSI cast. This time, there's five new cases to solve that are longer and more in depth than in the original game. It has the show's authentic locations, music, writing, scientific validity and visual style. Field evidence can be analyzed using a full set of forensic tools, such as fingerprint dusters, UV Lights, luminol, DNA sequencer and comparison microscope. Customizable options allow players to easily adjust the gameplay to suit their desired level of difficulty. There's also unlockable bonus content with pre-production sketches, "behind the scenes" footage and unusual trivia.